The National Endowment for Democracy (NED) is pleased to announce its Fall 2018 cohort of Reagan-Fascell and Hurford Youth Fellows. 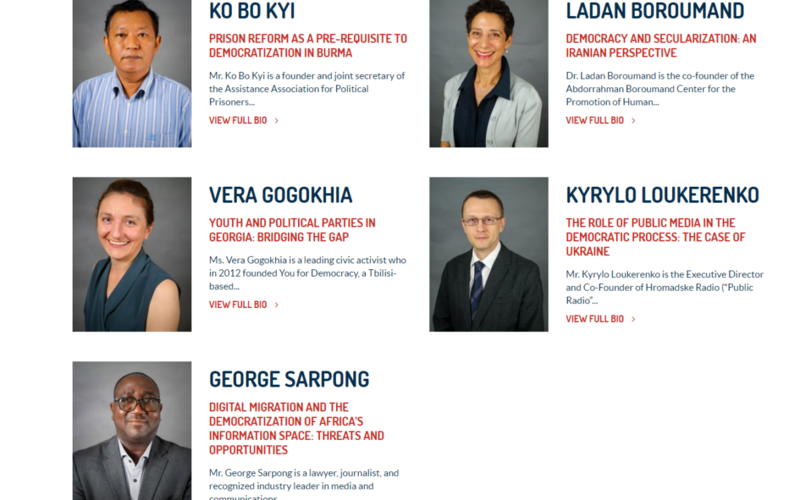 In residence are leading democracy activists, practitioners, journalists, and scholars from a wide range of countries, including Burma, Georgia, Ghana, Iran, the Philippines, and Ukraine. Based at the International Forum for Democratic Studies, a leading center for analysis and discussion of the theory and practice of democracy around the world, the Reagan-Fascell program has enabled more than 290 fellows from over 90 countries to deepen their understanding of democracy and enhance their ability to work toward democratic change.